Arts & Crafts oak book stand bound in copper with the words " Books like friends should be few but well chosen" With fleur de lys and a stylised flower. Offered in good condition and measuring 29cms in lenght, 14cms in depth and 13cms high. Arts & Crafts carved oak tray. Simpson? Pretty Arts & Crafts oak tray most probably made by Arthur Simpson. A lovely design with stylised leaves and berries to four corners and brass handles. Offered in good original condition measuring 65cms in length at handles and 55cms without handles. Width 36cms, Depth 3cms. 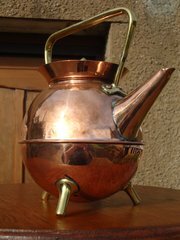 Arts & Crafts copper kettle by Benham and Froud from a design by Dr Christoper Dresser Offered in good original condition with minor dings and a historic solder to spout. Impressed mark to base. Height 23cms. Width at spout 22cms. 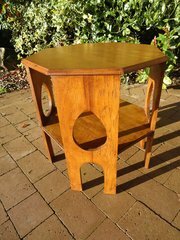 An unusually large version of this model of Arts & Crafts table with teardrops to four sides and an octagonal top. This one has a large lower shelf just perfect for magazines and this table which is in oak would make a perfect coffee table. 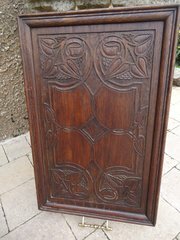 Offered in good condition having been stripped and refinished. Height 62cms. The top is 61cms x 65cms. Arts & Crafts copper candle holder with four fish around the candle holder and stamped Newlyn to the base. Offered in good original condition. I will clean it if requested. The length from the handle to the rim is 22cms. The width 12.5cms and the height 5cms. Rare World War II revolving desk stand made of oak with the copper and brass section turning and in the shape of an aircraft hangar. Stamped to base E C & Co Ltd 1941 for E. Camelinat of Birmingham who made Brodie helmets for the troops. Interesting as both the use of brass and copper was restricted during this year to war use only. One side holds and inkwell for three pens and the other side two small shelves for stamps or paper clips Very well made and offered in excellent condition. The base measures 23cms x 17cms and it stands 10cms high. 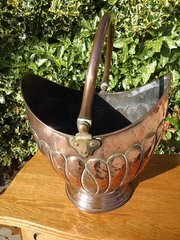 Pretty Arts & Crafts copper coal bucket made William Soutter and Sons, Birmingham and marked to base/ offered in good condition with very minor dings. Height excluding handle 36cms. Width 36cms. Depth 30cms. 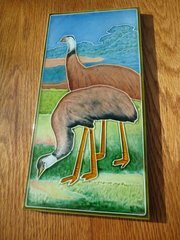 Unusual Arts & Crafts tube lined tile depicting two birds which I think are ostrich but could be emu. Lovely colours and offered in good condition. It is 31cms high and 15cms wide with a depth of 1.3cms - slightly deeper than usual tiles. I am unable to determine the maker. 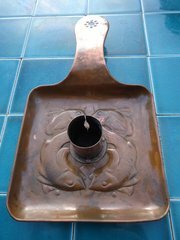 Unusual Arts & Crafts copper tray depicting a swimming swan. Attributed to Newlyn before it was compulsory to mark metal in 1908. Offered in good condition and measuring 16cms x 9cms. 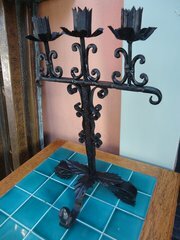 Arts & Crafts wrought iron candelabra with three candle holders attributed to Archibald Carne, the blacksmith of Truro because of his distinct zigzag pattern with spots to front. Leaves to base. Height 46cms. Width 43cms and depth 18cms. Offered in good condition but perhaps not the original finish as has been painted in matt black as very prone to rust.